We were at the designated meeting point of the Mega Center about 20 minutes before the 8am start time (because previous years needed people marked off and ready to leave at that time), and no one else was there. I wandered around a little and a couple of others eventually showed up, but it wasn't until 8am that I saw that people were waiting inside the Resort Complex instead of where we were supposed to be... which now had the Transformers Convention noted on the front of the building. 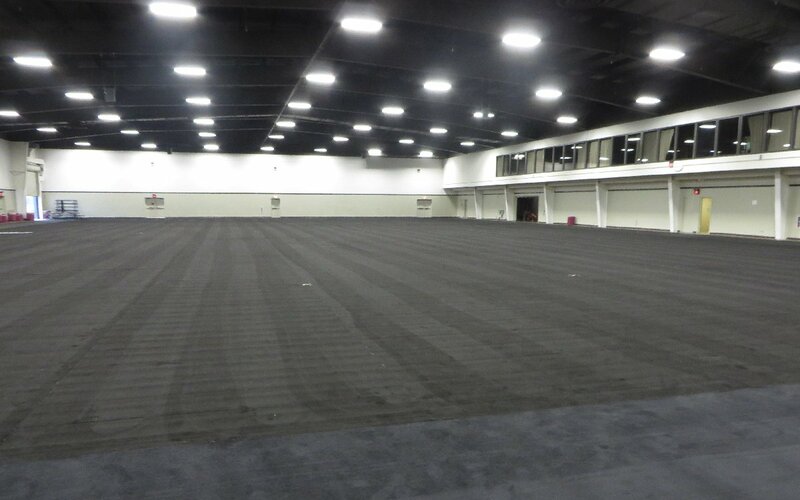 Since the doors were open, and since this was where we were supposed to be meeting for the Tour, I went inside to have a look at what would soon become the Dealer Room for this year's BotCon. 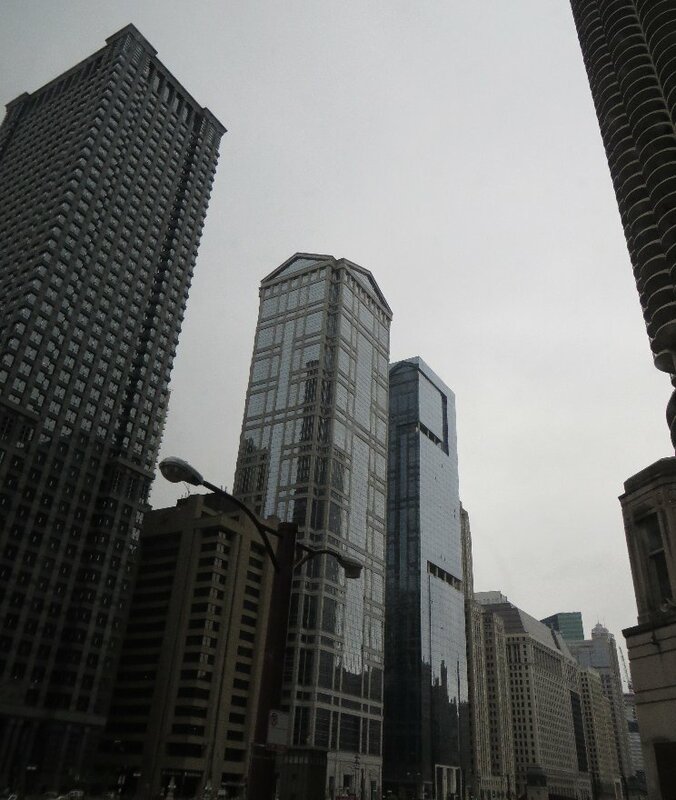 Back outside, it then started sprinkling a little, so I wondered if the boat portion of the tour was going to go ahead. There only ended up being 30-35 people on the tour, and about 15 of them were FunPub staff or family of staff. A nice way to start the convention for the workers, like one of those team-building corporate trips. After getting my name marked off, and hopping on the bus 15 minutes late, we headed off into the City, to Navy Pier first..
During the bus ride into the city I found out that there was another Australian at the Convention called Jack, that I was not aware of (because he isn't a member of the Ozformers fansite). And apparently it was his second BotCon, and he was from Perth, which is real dedication to be travelling that extra distance and be doing it again. He was pretty keen to let people know where he was from, which is how I was able to learn quite a bit about him without even talking to him... and a couple of the FunPub staff seemed to love the novelty of meeting an Australian, even though they've done it quite a few times at previous BotCons with me and other Australians I have witnessed them learning about their origin. We also heard what the Custom Class toy was this year, as people had been posting up details and images online while we were on our way - Galva Convoy from the Lio Convoy/Orion Pax Deluxe Generations toy. I was doing the Custom Class tomorrow, so you'll have to wait until tomorrow's page for details on how that went. When we got off the bus the weather had improved to be mostly cloudy with only an occasional sprinkle, but it was still not good enough for the boats to do any "thrill-ride" speeds or turns on the lake as planned. So it ended up being a leisurely 15 minutes straight out, and turn around for photos of the City before coming straight back in. 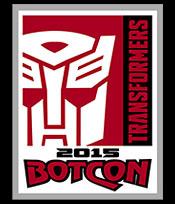 As such fatbot joined us, as he was going to sit out the boat ride if it was "wet and wild" as the BotCon Brochure said it would be. 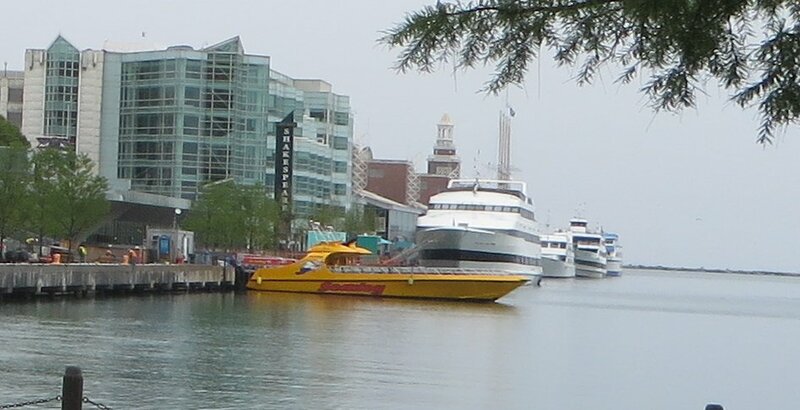 The yellow boat is one of two that do these 30 minute trips out onto the lake and back. 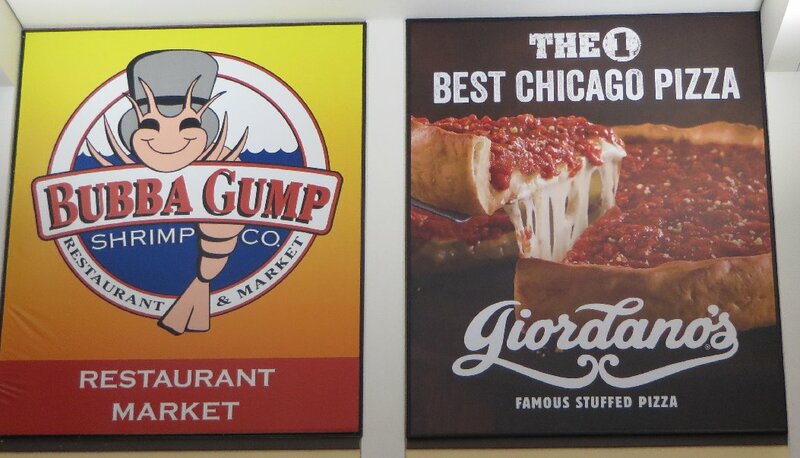 We had about 20 minutes before the boat ride, so we allowed to go inside the Navy Pier complex first to use the restrooms if needed (as was now 2 hours since we were getting our names marked off at the Resort). 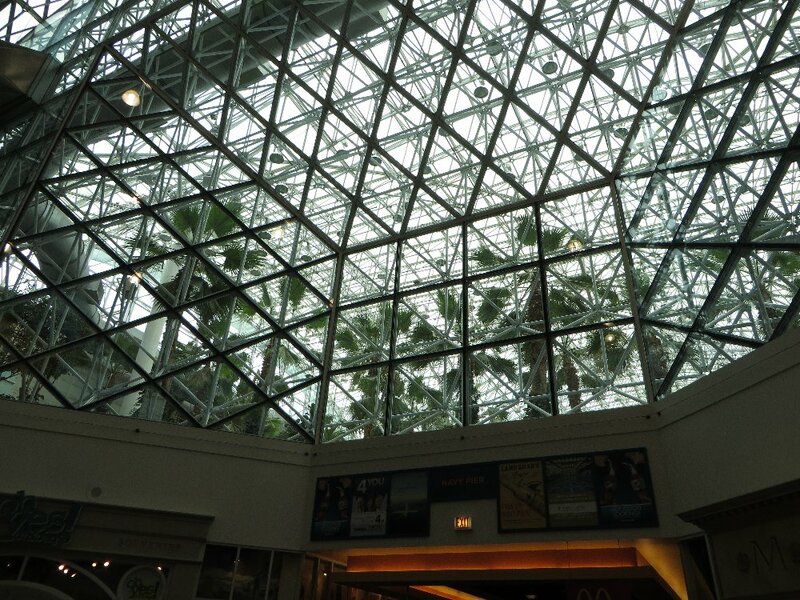 Inside the Pier is mostly entertainment (cinema, rides) and food (restaurants, fast-food)... and this tropical oasis. 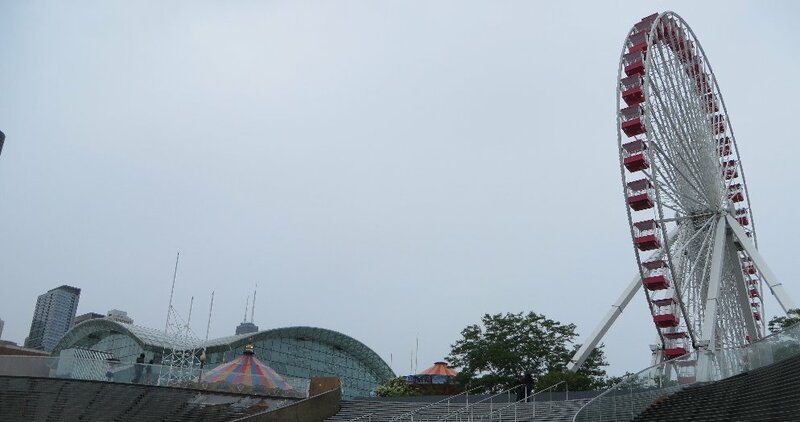 The outdoor entertainment includes a lot of fairground rides like carousels and a ferris wheel (which I learnt on yesterday's tour was invented in Chicago). This seemed to be Pete's rodeo, as he was in charge all day... with Brian off to the left in a BotCon T-shirt, which he often does on the Wednesday before anyone else has their's yet (package pickup is Wednesday night). I think it had been a rough few weeks for him with all the flooding that had been hitting Texas, as he looked to be very exhausted (more than previous years), and he was even sleeping at his table at lunch-time. We got our tickets and boarded one of the boats, and after a safety announcement, we headed off at 10.30am. 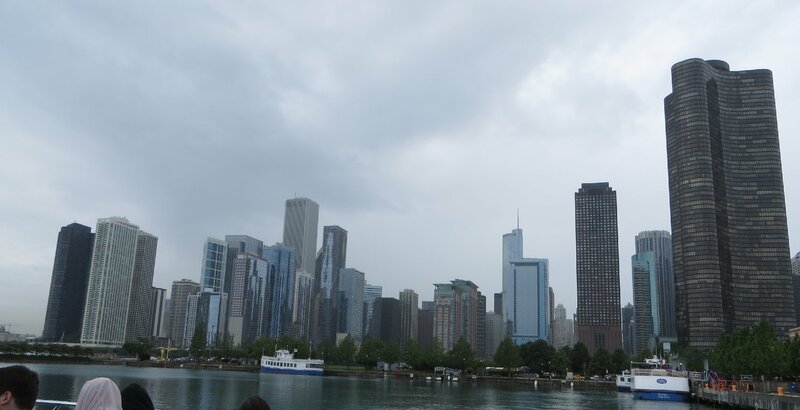 As I learnt on yesterday's tour, Chicago has been accessible to the Atlantic ocean since 1959, so it is a major "sea port" now, and also to all the other major cities on the Great Lakes. 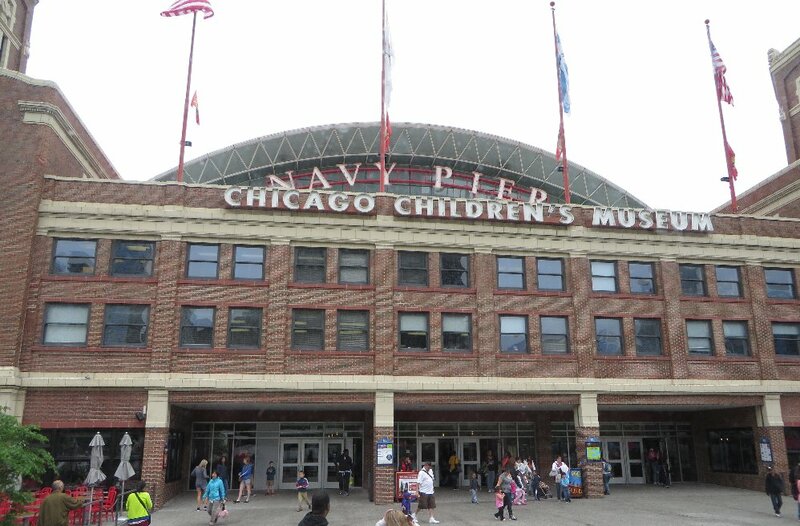 Navy Pier was named for being used by the Navy for training during the first World War, and it was used again for Aircraft Carrier training in the second World War, because it was an open flat body of water, and was out of range of Japan and Germany (by not being on the coast). The lighthouse at the opening of the harbour. Since the lake is so big, it can have rough "seas" like any ocean, so it needs the man-made rock wall to protect the shore and boats. This was the point we rode out to... a water pumping station that was built this far away from the shore because of pollution and contaminents nearer to the city and river made the water undrinkable. It is supposed to be one of four pumping stations, so I imagine that the thing in the distance of the photo above and below is another one... even if the structure on the right looks like a circus tent (to me). 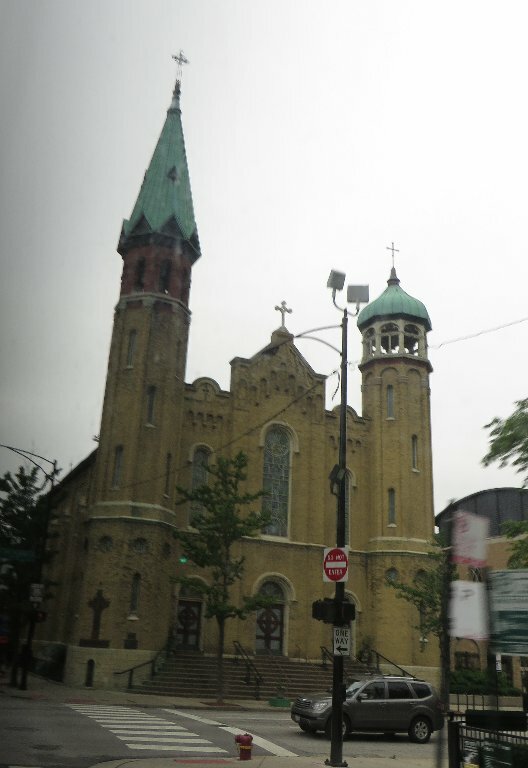 So we turned around just after we passed the pumping station and stopped for people to take photos of Chicago. You can see the four tallest buildings in Chicago... from the left - Willis/Sears Tower (black building), Aon Centre (left-of-middle square building), Trump Tower (right-of-middle building with spire), and John Handcock building (black building at the right with the two spires on the roof). Navy Pier is in front of the John Handcock Building. And back again... which was another 15 minutes back to the Pier. Going past the lighthouse again... which seemed to have everyone trying to take photos of it, but I don't think there is anything significant about it. I just took photos of it so that this part of my write-up had something extra to look at. 11am we were back and off the boat. Because it was still occasionally sprinkling, it was decided that we weren't going to be walking the 1.5km to some-where else for lunch, and would just have it at the Pier (which should have been the original plan anyway). We had until 12.50pm to ourselves, and my first thought was the Pizza restaurant, to get me some of that delicious Chicago Style Pizza. But when I went over to there it was only a regular restaurant, so you had to buy whole pizzas to dine-in for, and the pizzas were noted as taking about 45 minutes to prepare and cook. I decided that I would leave the pizza for later (to have one delivered to the hotel so that I could eat it casually and not have to worry about being too stuffed to be needing to do anything else). So I looked around the other options, and it took me a while to find something that I was even semi-excited about. 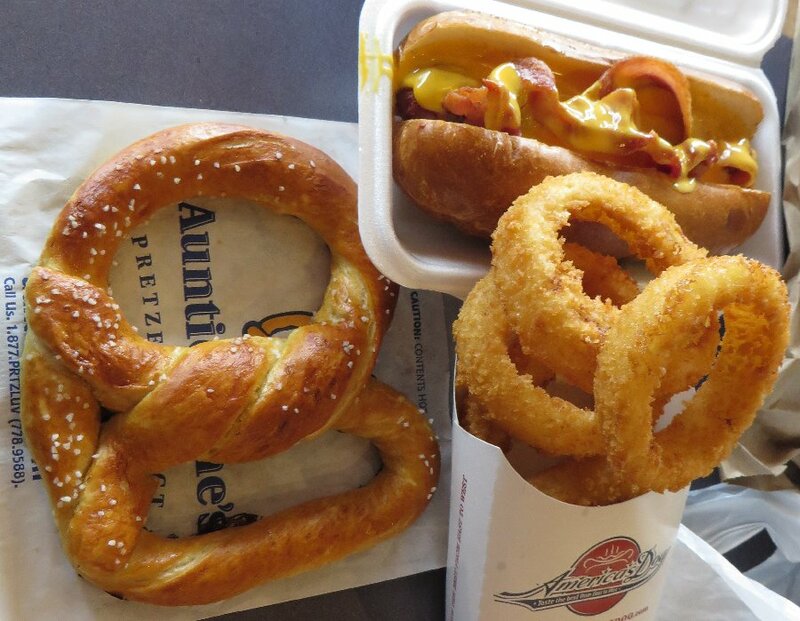 I ended up trying out this Hotdog place, as it sounded interesting, but I didn't want another Chicago Style Hotdog after not liking the one I had on Saturday on the way to Milwaukee. 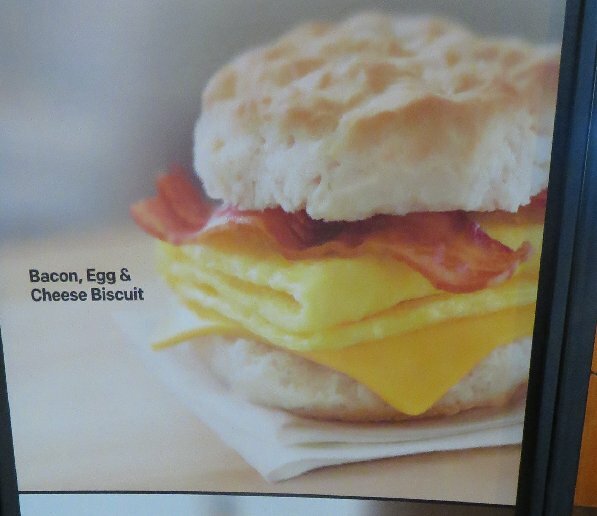 I took a photo of the menu board though, in case some of those Dogs are actually true to those cities. I on the other hand ordered a Francheesie, because it was the most unusual one on the menu. No Dispensor in the food photo, because I didn't bring him with me today as I didn't want to risk losing him (I didn't know what we were doing today, or what the boat ride would be like). Back on the bus just before 1pm, and off to pick up our Tourguide for the Mob tour. 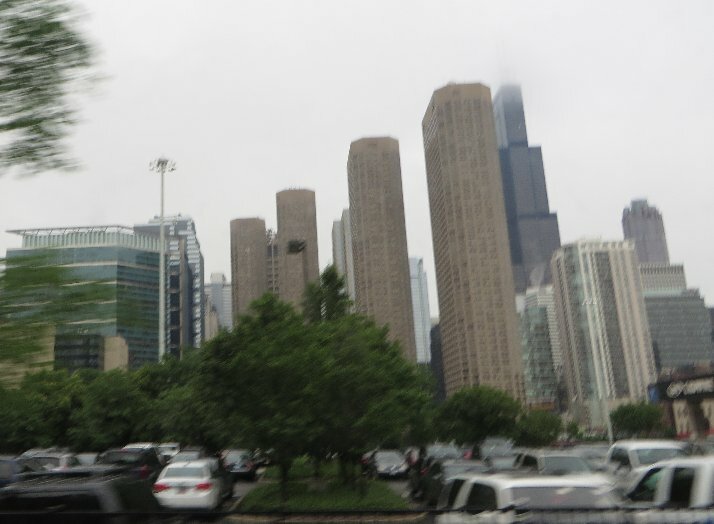 Driving past the entrance ot Navy Pier. We stayed north of the river and about 15 minutes later we stopped right at the location that would have been Stop 12 of the On-Off bus tour... if I had been able to stay on it the whole way. 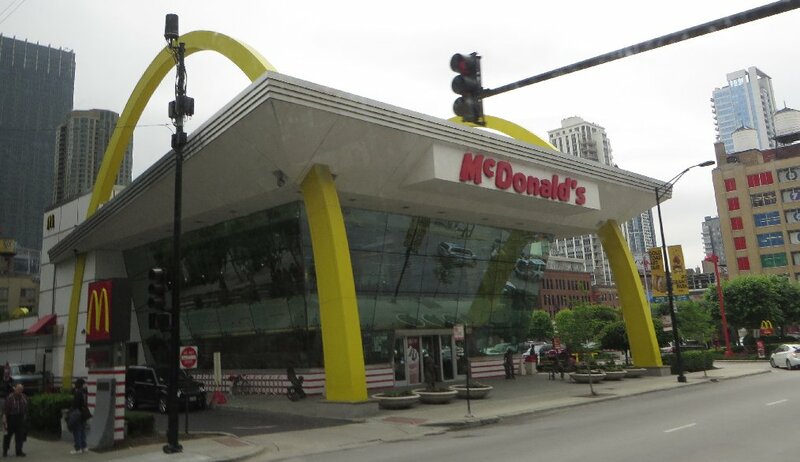 At this location there was this unusual looking McDonalds restaurant. 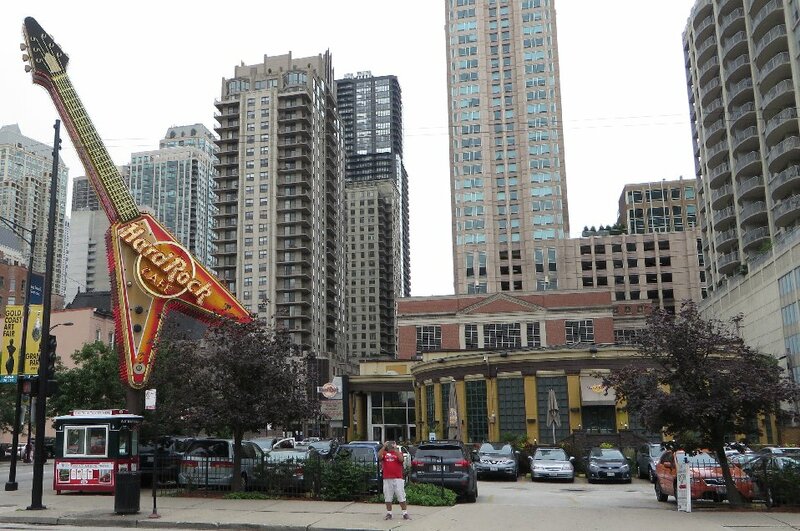 Plus a Hard Rock Cafe... which I remember from my 2003 trip to Chicago, but I'm not sure why I was heading up in this direction when all of the more interesting things were to the south of the the trainstation I would have come from. Nearby was this other restaurant, which had a giant frog and mushrooms on it. We knew that we must have been in the right spot, as the tourguide's regular bus was parked here. Since we had our own bus, we stayed on it instead of hopping on their bus. So it was about 1.30pm when we picked up the tour-guide, and we spent 90 minutes on this tour for a total of 2 hours of tours, plus the bus to and from the Resort for US$115. 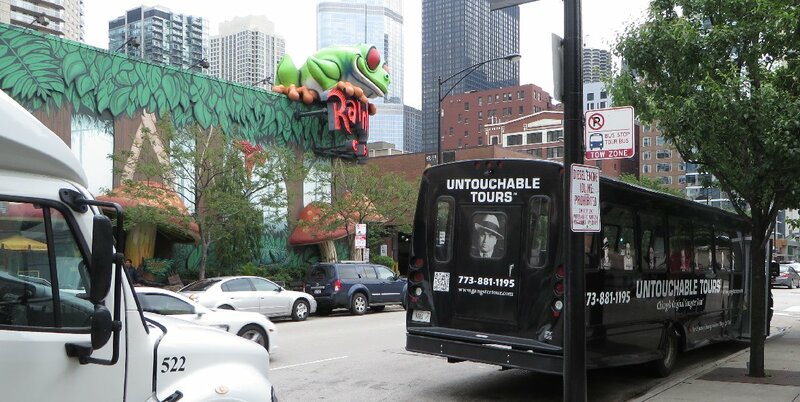 Since this was a Mob tour, the tourguide spoke about the Prohibition era in the 1920s, and about various Mob identities like Al Capone/Scarface. I didn't take much note of the things he was mentioning about the Mob, so if you are interested in it, do a search on the history of the Mob and Prohibition in the 1920s. For the rest of my photos below, it is just items that I thought looked interesting or worth mentioning. 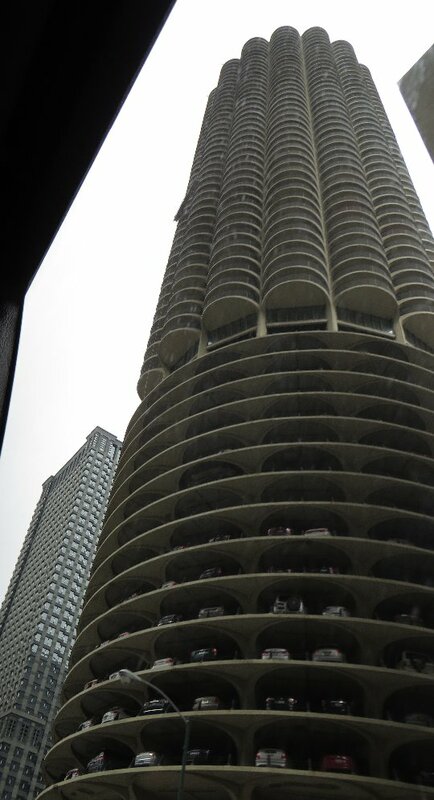 We started by heading south, passing by one of the two "corn-cob" buildings that I went past on the tour yesterday. 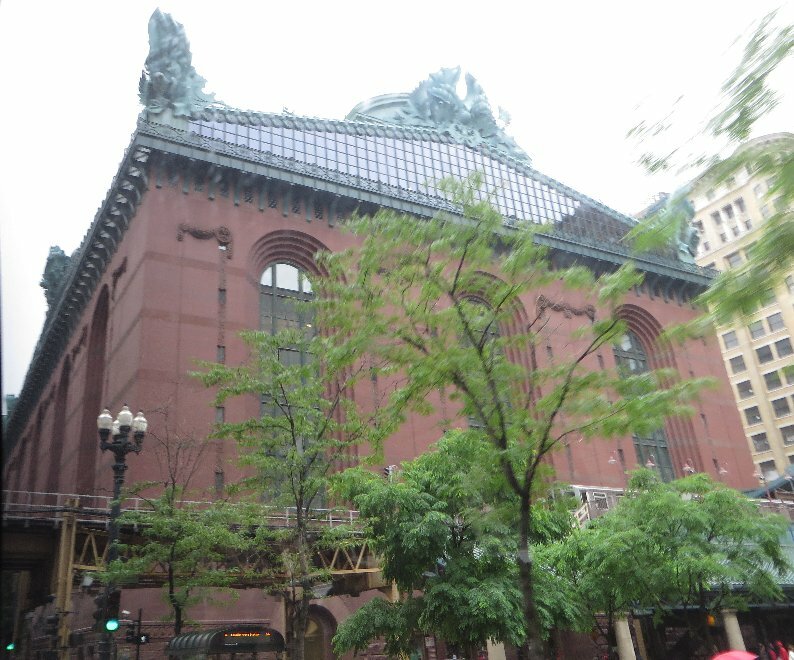 The library that I only saw from a distance on yesterday's tour... we got a closer look today, and it certainly has some serious sculptures on the roof for a library. 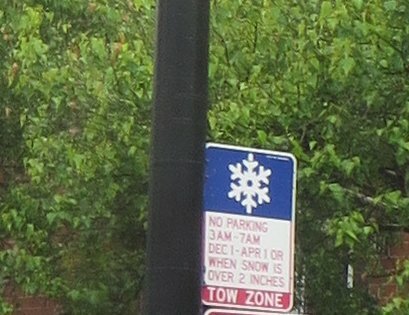 I saw this sign, which made me realise that this was a part of America that gets snow in Winter... something that we don't get in our cities in Australia, so it is alien to me to know how you deal with it. (other than all the rusted cars that fatbot and I saw, from the snow and salting of the roads). We drove past a building that the tourguide said was the first White Castle restaurant, but I wasn't able to get a photo of it... and looking up White Castle, it's first restaurant was in another state of America, so maybe it was the first one in Chicago (which is rather weird for him to mention on a Mob tour). 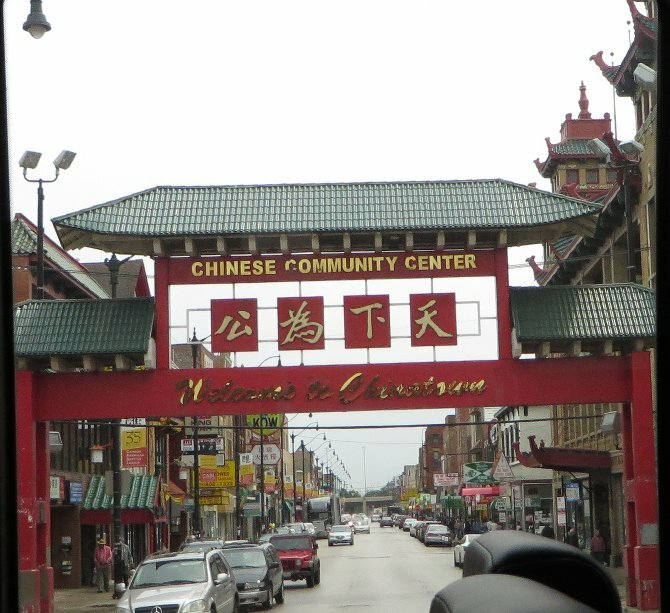 Now that we were on the south side of Chicago, which had China Town. 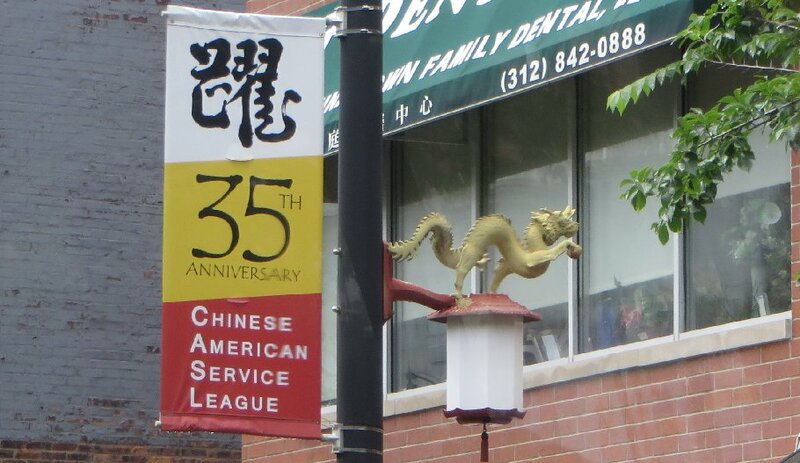 The street lights had golden dragons on them. 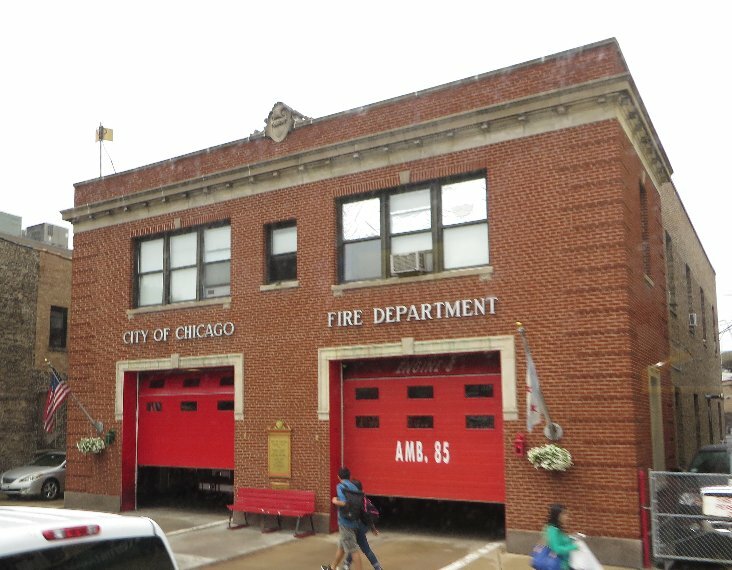 In the middle of China Town is this fire station, which our tourguide said was the one used for filming in the movie Backdraft. 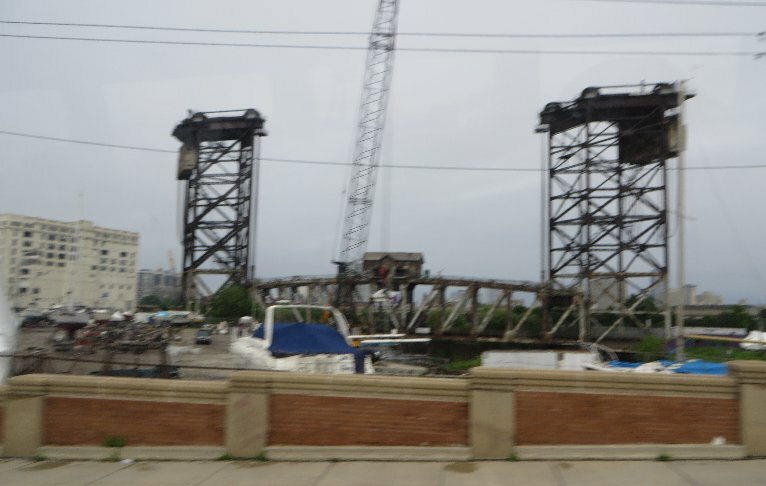 This was an elevator bridge, that raises when boats need to go through. It looked very old. 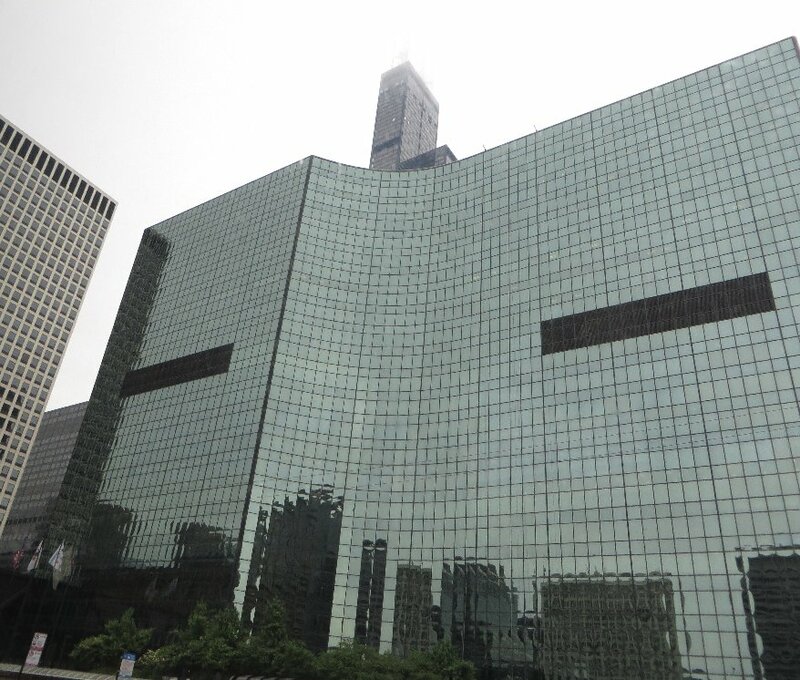 The Willis Tower behind a big wall of mirrored glass. 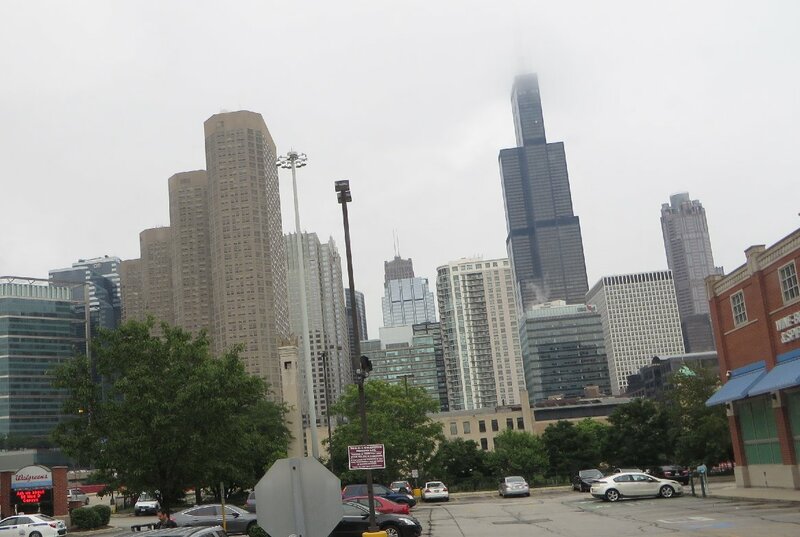 The top of the Willis Tower being obscured by the low level clouds. Too bad if you were someone who planned to go up to the observation deck today. 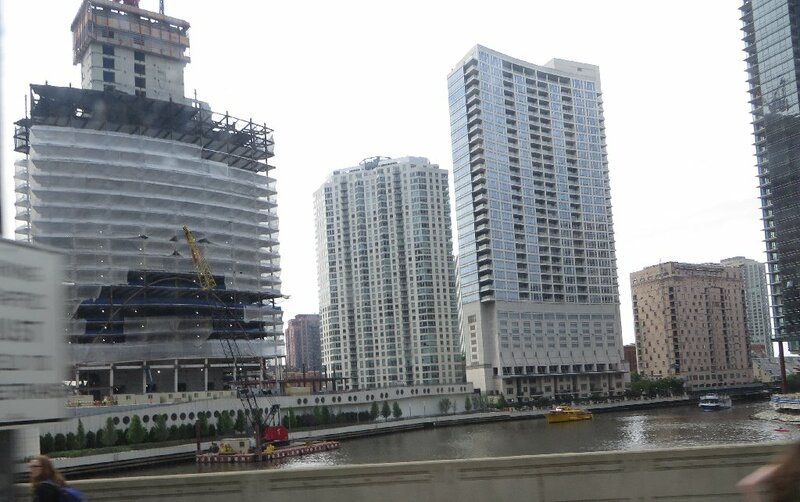 We were heading back north, on the western side of the Chicago river now. 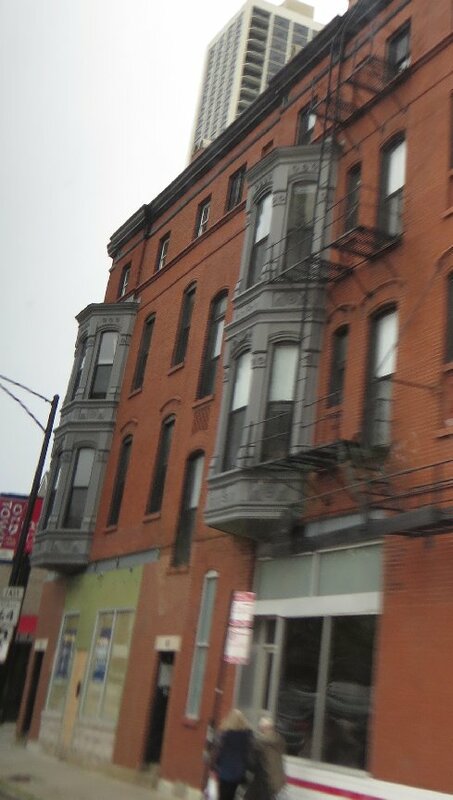 The row of four brown buildings looked really odd. I saw a few buildings like this - with rooms that stick out the sides of the building. 3pm and we were back at the start of the tour and we let off our Tourguide. After about 10 minutes of allowing people to go use a restroom if needed (because it would be a couple hours until we got back to the Resort), we headed off. The tour was supposed to go until 6pm, so it seemed very early to be heading back. I suspected that the traffic would be as bad as Los Angeles, and they knew that they needed at least a couple hours to get back, as the FunPub people had work to do before the start of Package Pickup at 8.30pm. Heading east along the northern branch of the river. 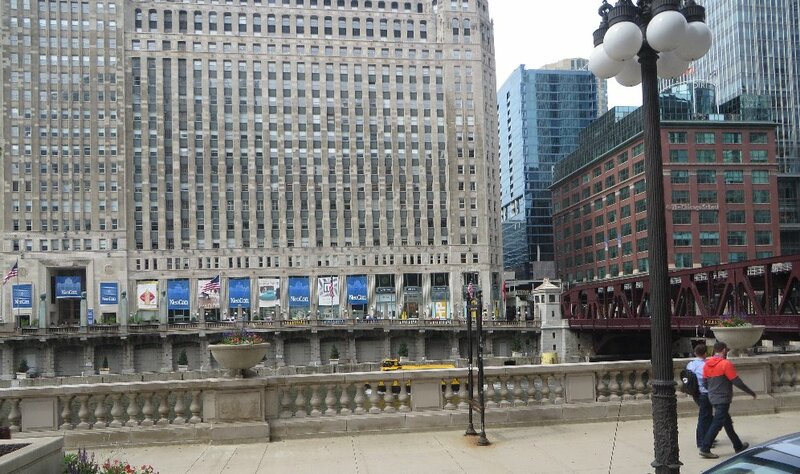 This is the fork in the Chicago River, where the north branch (where the blue/white boat is) meets the south branch (to the left), and leads out to the Lake (to the right). This is looking up the North branch of the river (with the direction of the lake to the right), and that bridge that is pointing up in the air is no longer a working bridge. 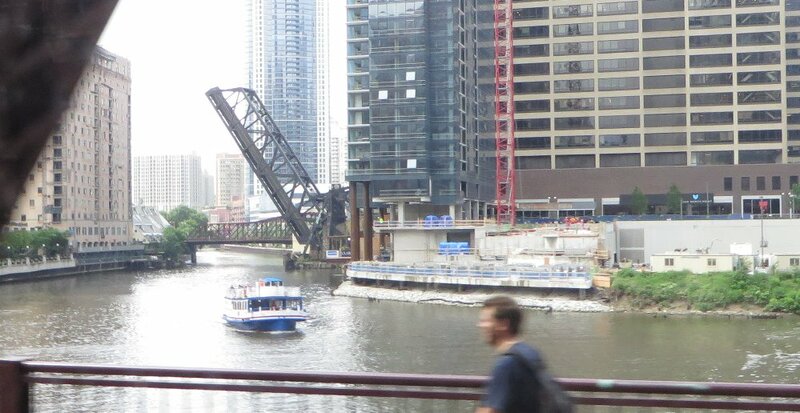 It is the Kinzie Street Railway Bridge, and it is locked open and preserved because at the time it was built (in 1908) it was the largest and heaviest counter-balance bridge like that (to let boats go under). 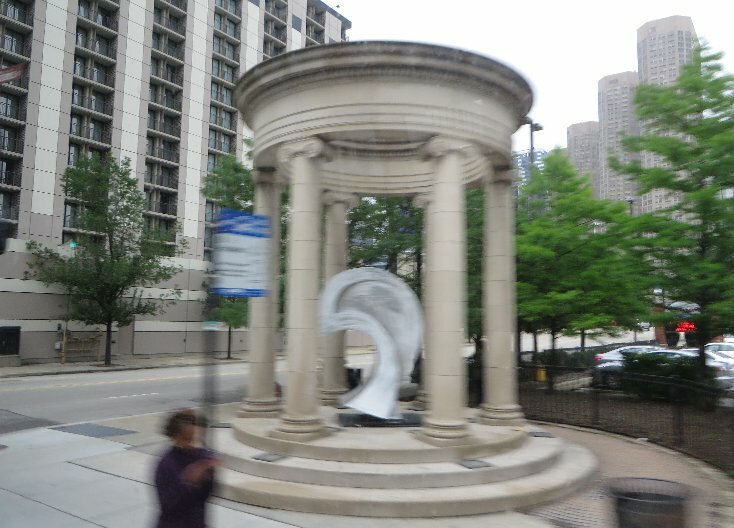 It was also the site of the first known bridge across the River in Chicago in 1832 (for pedestrians). 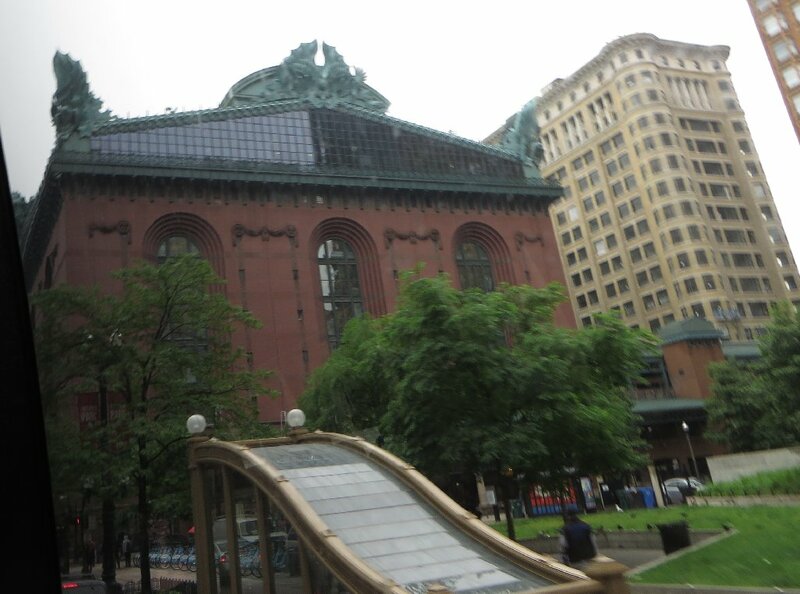 The trainline that used the bridge would originally go all the way out to Navy Pier, but it was finally shut down in 2000 and left locked open. 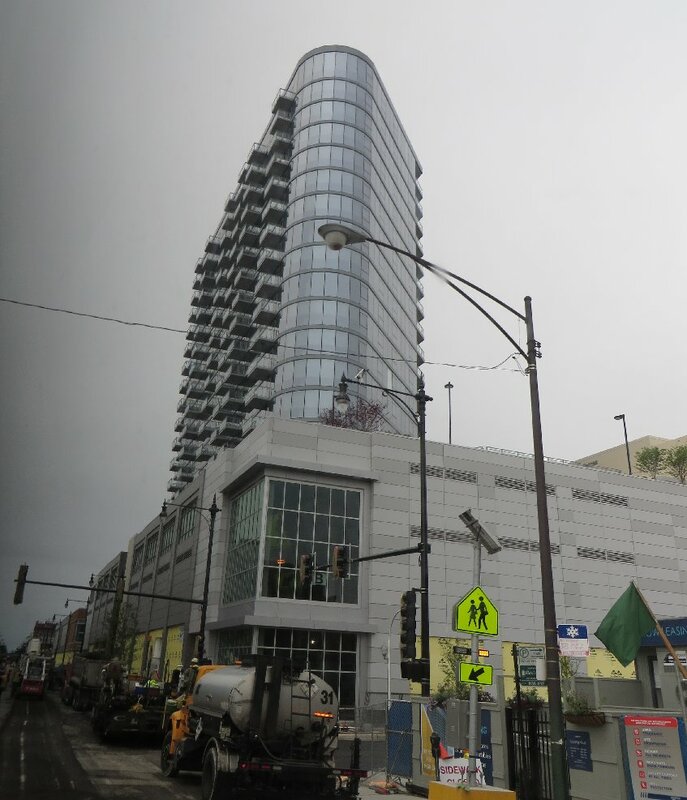 On a related note, in 1992 while the foundations were being reinforced for the Kinzie Street Road bridge (behind the railway bridge), drilling caused the river to flood into an underground tunnel, which was part of a network under that part of the city, resulting in flooding of several buildings and a shopping centre that were below ground... and shutting off of the electricity and gas for several days. 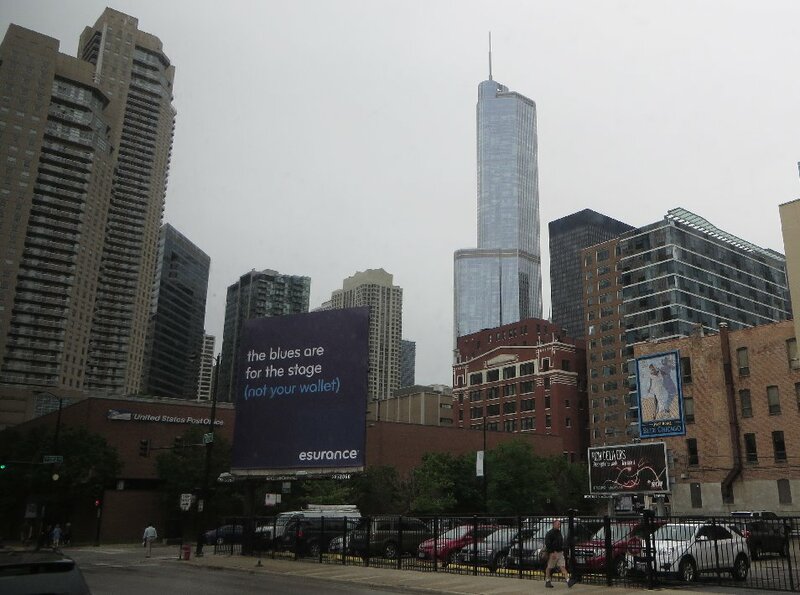 It was their most costly flooding in Chicago's history, but no one saw a thing above ground. As we were near the Resort, a donut shop... there are so many stand-alone donut shops in America. In Australia, you would only find small kiosks in shopping centres... until Krispy Kreme arrived. Oddly enough, I don't think I have ever found a Krispy Kreme store in America, but that's where they came from. I did find them in the grocery store (like our 7-11 stores), and a guy was there at the time restocking... and taking out all the old donuts, which were a lot, and they would probably all end up in the bin. It took almost 2 hours to get back because of the afternoon traffic, and not hitting the freeway until about halfway to the resort (it must have been really bad to go through the suburbs... considering that those freeway/highways are built to make it faster than going through the suburbs), so it was almost exactly 5pm when we arrived at the Resort.